Home / Winger News / Posts / Winger News / Maserati at the 89th Geneva International Motor Show. 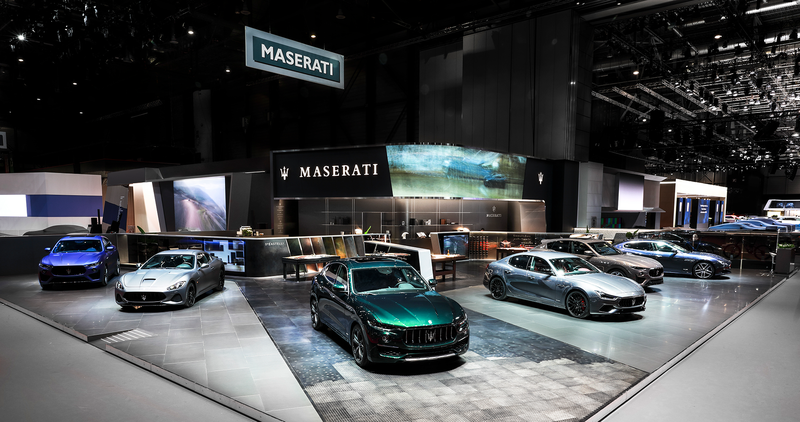 Geneva, 5 March 2019 – Europe’s biggest Show of the year and Maserati presents a Maserati Levante ONE OF ONE giving a foretaste of the future customisation programme. It has been customized to fit the profile of Allegra Antinori, Vice President of Italian wine producer Marchesi Antinori. At this 89th edition of the Geneva international Motor Show, Maserati further highlights customisation and the superlative expression of Italian identity with a blend of exquisite craftsmanship, state-of-the-art technology and sophisticated aesthetics: a unique, exclusive mix achieved through an interactive experience involving the Italian materials of excellence present on the stand. At the 2019 Geneva International Motor Show, Maserati presented an absolute novelty: the Levante ONE OF ONE, a foretaste of Maserati’s future customization programme. The stand showcases a Maserati Levante ONE OF ONE entirely customized by Allegra Antinori, Vice President of Italian wine firm Marchesi Antinori, world leader in quality wines. The Centro Stile Maserati assisted Allegra Antinori in the configuration of her car, in a genuine process of shared creation, a concept which is much more than the mere choice of accessories. A unique project in which she expresses herself, her emotions and her story. Implemented in this way, the special bond between Maserati’s ground-breaking innovation and the attention to detail normally found in the workshops of traditional craftsmen comes to life in a unique Maserati. In this first example of the new customization process, every detail Allegra Antinori has defined is closely linked to a facet of her personality. The external configuration is a distinctive tri-coat green, a special, unique colour inspired by the shades of the Tuscan hills. The external details (door handles, side air vents and grille inserts) are finished in dark look chrome, toning to perfection with the body colour to give the Maserati SUV a truly sophisticated overall look. The interiors of Allegra Antinori’s ONE OF ONE features many unique combinations, which have never previously been used on a Levante. The lower dashboard, door panel, central tunnel unit and seat colour references the warm hues of the earth of Tuscan vineyards. The unique “Pieno Fiore” leather used for the seats is another exquisite choice: it is coloured with aniline and oils, with no surface finishes, but is ornamented with classical button-tufted effect 3D embroidery. The technique used provides exceptional depth of colour and a very smooth tactile sensation, and like a fine wine, this leather will simply improve with age. The central tunnel is in a special finish using a material that is new even for Maserati: carbon fibre with copper wire and high gloss finish. Here again, there are clear references to the Antinori estate and the concept of Cor-Ten, the weathering steel used for the construction of the Antinori Winery in the Chianti Classico area, midway between Florence and Siena. The 100% natural mohair wool mats provide the final, exclusive touch to a tailor-made customization with attention to every single detail. Maserati hosted in their stand – together with Ermenegildo Zegna, a longstanding partner and a leader in the field of men’s luxury clothing – two other leading artisanal firms in their field: Giorgetti, the internationally renowned Italian woodworking company, known for its furniture and unique design pieces, and De Castelli, a leading metalworking firm, specializing in the production of unique home design accessories, custom surfaces and projects. The stand provided an interactive tour through three different thematic areas, each of them with a dedicated working table. Each area featured a display of materials and components that bear witness to the unending quest for excellence, style and originality, typical of products designed and Made in Italy, and therefore typical of Maserati. Speaking of innovation and design, when it comes to customising the stand, for the first time ever Maserati’s Customisation Area, there was a D-Table, the only multi-touch, interactive table featuring an elegant and sophisticated design. Latest-generation software will enable customers to configure their cars by selecting external and internal combinations, colours and materials at a touch. Customers will were offered a unique experience for the configuration of their individual Maserati, using the customisation features present on the stand. The Zegna working table illustrates the Zegna-Maserati tailoring atelier, from the preliminary phase of weaving the PELLETESSUTATM using spools of sturdy bands of leather, through to the rolls of resulting woven material in the Maserati leather colours (black, tan, red and dark brown). Like a fine, made-to-measure shoe, this PELLETESSUTATM (woven leather) adapts its shape to the sinuous surface of the Quattroporte Maserati dashboard (the featured element of the interior, over which the PELLETESSUTATM fits perfectly; the three-dimensionality of the woven strips of leather create a tactile surface for this component, restoring light and texture, imbuing the volume of this component with expressive force). On the table one finds two Quattroporte dashboard fascias covered with black and tan PELLETESSUTATM. The table also displayed five decorative Maserati Levante door panel trim elements, which reveal the opportunities for chromatic customization of the Maserati PELLETESSUTATM. The PELLETESSUTATM tiles represent studies and design research between the Ermenegildo Zegna Style Centre and Maserati, exploring jacquard designs that mix colours, graphic elements and patterns with an eye to potential customizations. The sketches depict the research carried out by the Centro Stile Maserati into textures, their visual application to the various components and efforts to balance and harmonize colours within the context of the car interior. The Giorgetti working table is the one featuring outstanding woodworking and cabinetmaking skills. By means of three Quattroporte dashboard inserts Giorgetti illustrates the protagonist role of wood when it comes to Maserati components, highlighting how initial mechanical processes are followed by manual ones, operations like precision carving work, turning and modelling in three of the 12 Giorgetti wood species: Ash, Walnut and Maple. The table also features a wooden panel in antiqued ash with Shibori decorations, the inspiration for the two Quattroporte dashboard fascias which feature this technique in a micro-shibori version, styled and expressed all-over pattern sections. The smallest dashboard inserts feature the same treatment for larger elements on the dashboard in antiqued Ash burl wood and natural Ash burl wood. Finally, the sheets of veneer complete the table as elements of stylistic research in which Giorgetti and Maserati experiment with wood species which are transformed into graphic landscapes in the case of the Ziricote wood, or dynamic textural effects in the case of the Tanganika Frise. The working table illustrates the dynamic encounter between the Italian virtuosity of De Castelli, when it comes to creative metal surfacing, and Maserati’s eagerness to embrace and interpret this poetry in metal. The sophistication of the metal working processes applied to its interior components (the dashboard fascia and the pedal trims) serves to further enhance the interior, not only formally but also by introducing a sense of poetry and textural allure. A storytelling inspired by the chromatic richness of the Italian sea- and landscape. The four sheets of metal demonstrate the process of working the semi-finished material. The sheet of raw material in its pure form is subjected to a manual hammering phase, fashioning it into the shape of the Quattroporte Maserati dashboard. The featured element of this interior, is perfectly suited to communicating the subtle chromatic and poetic transitions of the DeMarea finish, selected for this exquisite work of art. The other two elements illustrate the phases of oxidation and surface transformation of the brass: human manuality, creativity and sense of aesthetic pleasure decide when to stop time and halt the process of oxidation, ascertaining the perfect moment for obtaining the DeMarea gradient. This process is simply defining the uniqueness of each detail. On the artisan’s working table and creative space, the process of storytelling proceeds with the help of tools or historical instruments, where metal sheet is shaped into a work of art. Subjected to various surface treatments, the sheets of metal convey the excellence of the De Castelli world, not to mention Maserati’s flair for style. The working table also displays a Quattroporte dashboard fascia with the DeMarea Iron, DeMarea Copper and DeMarea Brass finish. The DeMarea trilogy illustrates a single process composed of superimposed, polysemous manual oxidation operations. These are all inspired by Italian sea- and landscapes, creating “watercolour” effects, conveying highly textural sensations and evocations of waves lapping against Venice’s signature mooring posts. The encounter between De Castelli and Maserati also expresses itself in the pedals. These key elements for operating a car have been embellished with a hand-applied oxidation treatment, boasting a snazzier, more sophisticated flair in the DeMarea Copper kit, combined with the luxurious pad in vegetal-tanned Saddle Extra leather, which is inspired by the soles of made-to-measure shoes. While a more “art workshop” flair distinguishes the DeMarea Iron kit, brandishing logos engraved with the Maserati name. The sketches depict the research for texture inspiration carried out by the Centro Stile Maserati. Their visual application to the various components balance and harmonize colours within the context of the car interior.